Last Week This Morning: Sine Die at Last! Josselyn and Emily May 5, 2018 Last Week This Morning! The 2018 Legislative Session is finally over! The end of session brought several remarkable progressive victories—especially when it came to terrible, awful, no-good bills failing to pass! Check out our full end-of-session write-up here. 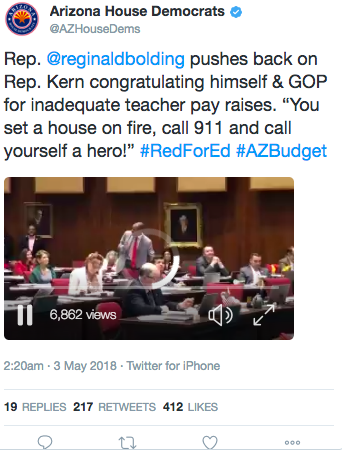 Above all, this session was about watching the power of the #RedforEd movement in action. K-12 education in Arizona now has hundreds of millions of dollars more in funding than it did last year, a remarkable achievement. Our education crisis isn’t over, not even close. But then again, neither is this movement. Check out Sylvia Allen giving a theatrical, over-exaggerated thumbs-down to teachers on the Senate floor this week. We hope her voters do the same to her in November! APS raised electricity rates in 2017 and made $488 million in profits. Now they’re demanding another rate increase as payment for cleaning up their pollution at the Four Corners Power Plant. Tell the AZ Corporation commission to reject APS’ pollution tax! Ducey will be in Tucson on Thursday hosting a luncheon at a swanky golf resort. We’ll be there too to remind him that the movement for education funding is not going away. Join us! Four amazing youth volunteers from LUCHA were badly injured in a car accident this week. They need your help – donate now to help cover their medical expenses. LUCHA is fighting against the deeply unjust cash bail system, which allows some people to go free while keeping others in jail because they just don’t have the money. This month, they’re bailing out moms in order to bring families together in time for Mother’s Day. Donate towards the bail fund here!